Some would argue that John Dewey was one of the most influential thought leaders on education in the twentieth century. His ideas on experience, reflection, democracy, community and environments for learning have made their mark on education for generations to come. In my opinion, he was a man before his time. We seemed to understand what was important in education in the 1940s and then somehow got side tracked. See how familiar this sounds. "The world is moving at a tremendous rate. Going no one knows where. We must prepare our children, not for the world of the past. Not for our world. But for their world. The world of the future." Learning by doing. Learning through real and authentic experiences. Dewey's thoughts have laid the foundation for inquiry driven approaches. According to Dewey, all learning begins with the learner. What children know and what they want to learn are the very foundation for learning. in their gifts of artistic expression. These four points are the foundation for passion-based learning. Dewey suggests that schooling is not just about the individual. It is the coming together of the child's interests with those of the society or the community. Today's Web-based tools extend that idea to the global community. Just take a look at progressive education in the 1940s. Here are other ideas of John Dewey. They still ring so true for today. “…education must be conceived as a continuing reconstruction of experience;that the process and the goal of education are one and the same thing” (Dewey, 1910:1937). “To see teaching and learning as the act of nurturing is to understand the essence of the phrase, to educate.” As Dewey posits, learners grow in concert with others. “Every experience lives on in further experiences. Hence, the central problem of…education…is to select the kind of present experiences that develop fruitfully and creatively in subsequent experiences” (Dewey, 1937, p.45). “Real, genuine attention means mental movement, not only on the part of the individual but also on the part of the class. It means that ideas come into the class, various persons follow out those ideas, and new points are brought out; and yet the teacher harmonizes it all, combining this play of variety, this expression of different elements, so that it leads consistently and consecutively in a definite direction” (Dewey, 1904). 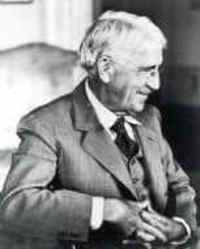 “…it behooves the school to make ceaseless and intelligently organized effort to develop above all else the will for co-operation and the spirit which sees in every other individual one who has an equal right to share in the cultural and material fruits of collective human invention…” (Dewey, 1937). Dewey’s ideology and his approach to education encompassed a view that human beings had the natural tendency to connect with others, “to give out, to do, and to serve” (Dewey, 1916). I love his idea that humans have a natural attraction toward collaboration and connecting. To see teaching and learning as the act of collaborating is to see the teacher as one who values teaching and learning as more than just an end unto itself. Teachers from Dewey's perspective are charged to create a community of learners who construct meaning within a socio-cultural context. I'd love to hear your thinking on Dewey. Do you agree he was just a little before his time? Thanks for this video and explanation of Dewey's key ideas. It is interesting that a lot of the discussion about pedagogy is not new but has a long history that can be traced through Dewey, Piaget and (as Dewey himself says in the video) to Socratic philosophy. I did find it a little disturbing that these "progressive" methods still have not displaced the dependency on rote learning and passive teacher-centred instruction. One area that we can build on in our globalised world is to challenge students to think and construct meaning in ways that extends beyond their own (often narrow) socio-cultural context. "According to Dewey, all learning begins with the learner. What children know and what they want to learn are the very foundation for learning." That quote is one of the most important in your post Sheryl. How many kids start multiplication before they can add? How many kids don't know where they live, yet we teach them about foreign countries? How many kids can't read very well, yet in the upper grades the learning that takes place in Social Studies is reading the text. If we just slowed down and stopped cramming information down kids throats, education would change and --- learning would truly start with the learner! John Dewey understood children. I wish more teachers did. I am going to be teaching two new curriculums this year and am already getting grief from fellow teachers because I don't want to teach from the Social Studies book. The textbook is boring. I want my kids to realize that US History is not dull and that they need to understand where our country came from in order to lead it in the future. Why can't more teachers believe that we have to do more than lecture to the students and have them spit back information? I have to ignore their comments and do what I believe will engage my students best. Thanks for the post. This is what I needed! Excellent post and extraordinary video! How did you dig it up? I couldn't help but notice that every adult and child in the video was white, which shouldn't be surprising considering when it was made. However, there is still a parallel with today. I suspect that the schools that do use more constructivist-type learning can be found in more predominantly Anglo and middle and upper income communities than in lower-income neighborhoods (though I'm sure many do not). Even a lot of the supposedly progressive private charter schools that are starting in inner-cities seem to feature much more of the drill-and-kill approach. Not only was Dewey was before his time, but now that his time has come, today's conversations about education would be made richer by an acknowledgment that many "new" ideas about what good teaching and learning looks like are actually foundational philosophies of education formulated by Dewey and other great thinkers. I can't help but wonder to what extent we inhibit real change by ignoring these fundamental theories, both in dialogue about education as well as teacher preparation and practice? Cindy said, "I did find it a little disturbing that these "progressive" methods still have not displaced the dependency on rote learning and passive teacher-centred instruction." Me too. It makes one jaded a bit to think that 60 + years we have known what is in the best interest of children but rather do what is in the best interest of educating the masses. I so agree Chris. The end has overtaken the means. I always say, "People before things." Somehow in education we have lost sight of that-- it is all about the end and not the child. Sherry I hope you will come back and share the outcome of you advocating for your students through your methodology. Let us know how it is going. It is hard to lead-- but teacher leaders are those who are willing to take a stand on behalf of kids in a culture where we are all suppose to think and do exactly the same. Don't even get me started on how we treat children of poverty. As someone who personally experienced this-- help me understand, why do we assume that because a kid is highly transient and moves a lot that we have to take them back to ground zero and start all over each time they land in an effort to fill in the gaps? Why can't we start with what they know and let them fly? Scripted curriculum is designed to be dummy proof, in my opinion. It assumes that low economic schools have children who are too far behind to be creative and learn through their passions. It also assumes that our worse teachers teach in our neediest schools and therefore need to be told what to say and do-- we simply can;t risk their passion getting in the way of memorization of facts. I agree. Why do we not weave educational theorists throughout the preservice curriculum? Why do we not use the theories to teach teachers to question, think, and reason? Why is teacher as researcher a bad thing? Is all of this political in some way? Yeah, thanks Paul. That is exactly my point, we have been saying these things for a very long time. This is how learning should be. Learning 2.0 is both timeless and relevant to modern day environments and their impact on the way we process information. I hope all of you will drop by again and help to stretch my thinking! The article was referring to performance of all freshmen in Chicago Public Schools in 2004-05. Instead of talking about how poorly motivated kids were to attend school and learn, the article focused on tactics, such as keeping all freshmen on a second floor so they could not leave school. To me, the conversation is too focused on schools and the school day, and not enough on the non-school hours and what businesses, hospitals, professions and universities can, and should be doing to reach kids with mentoring, learning, inspiration, and experiences that help build aspirations, which are essential for motivation in learning. That would then lead to a discussion of where such learning and mentoring can take place in neighborhoods where schools perform most poorly, e.g. high poverty. Organized tutor/mentor programs can offer this connection, if they are available. However, there are too few people even talking about this in their education discussions, and thus too few people innovating ways to make such programs available. This is a form of adult learning, which is also something that needs to be on-going. It's a habit that needs to start when kids are young. I hope I can connect the people responding to this discussion with this more expanded discussion of distribution of learning and mentoring opportunities. I think you are really onto something. I remember in college how all of our education courses always referred to the educational pendulum and how it swings from one pedagogical idea to another and back again. I think maybe our schools (especially at the secondary level) had that collaboration Dewey refers to and we lost it along the way. After all public education did go through the pods/open classroom/ love everybody stage. Somebody had to do some cooperating and coexisting to make that work. I like the quote you used... “…it behooves the school to make ceaseless and intelligently organized effort to develop above all else the will for co-operation". We must now take the idea of cooperation to another level to true collaboration. We as teachers must put our pride behind us and realize that sharing and learning from each other is the only way to truly teach our students. This is so imperative for an effective school and an effective classroom. Thanks for this post and for inspiring me to get back in the saddle of commenting again. Time Magazine article, “How To Build a Student For The 21st Century,” (December 18, was just the latest call by progressives to revamp eductaion. Bear in mind, progressive education has brought the NCLB. The studnet-centered, progressive models are irrestable to many people and seem right, just like it seems right that the sun moves through the sky as one lies on the beach on a sunny day. But deeper analysis holds the opposite to be true. Unfortunately, Tradionalists are seen as the heretics today in a an education establishment dominated by progressives. This “crisis” in education has come before, as far back as the nineteen twenties. In 1925 William Heard Kilpatrick of Columbia Teachers College said that instead of teaching facts and figures, schools should teach students “critical thinking.” Students need to learn how to “look-up” information in the modern world - the 1920s! In his “Child Centered School,” Harold Rugg urged in 1928 a shifting of the focus to a child-centered environment. (Heather MacDonald) These so-called cutting-edge progressive education theories are old. Moreover, they have never worked with most students. And what are the wares of education schools? Theories. Of course educrats will say that knowledge is not important because content - history, math, science, literature etcera - is outside their area of theories. More often than not, student-centered, group work is inefficient and less effective in helping students attain the kind of education that is going to help them succeed. Constructivist education is in the end obsurd. There has been a proliforation of Kaplan study centers and the like, because the recent upsurge of progressive education practices over the last 15 years has forced students to get direct, teacher-centered instruction elsewhere. Education should not be expected to be fun and immediately relevant. It should better than fun. It should be fulfilling and mind expanding. It requires lots of work and intensity. We do not need longer school days or schools years, we need more intensity and content oriented education. For fun we can have more team sports available to more students at all ability levels; they can learn “cooperative” skills, while bringing more blood to their brains and building self-esteem through hard work. This is *so* me, as of late... Thanks to http://rbvandijk.edublogs.org/ for the point to these fantastic, shareable cartoons. Cartoon by Dave Walker. Find more cartoons you can freely re-use on your blog at We Blog Cartoons.